Cercius doesn’t sound like an “old world” wine, and the label doesn’t have that traditional look that I prefer, but it definitely is an “old world” wine. I opened the bottle an hour before tasting. It offered a moderate nose of blackberry. In the glass, it looked like plum juice. But, upon tasting, I wondered how anyone could award this wine 93 points. It was so tannic (think of over-steeped black tea) that my lips couldn’t part after tasting. But I knew that the wine was “closed in” (technical term for the wine needing oxygen to open up). What a shame it would have been had I not then aerated the wine. Not only aerated, but allowed to sit in the glass and then swirled. But before I describe what happened, let me explain what the wine is: 2010 Cercius Cotes du Rhone Villages. By “old world,” I mean Europe; specifically France – more specifically the Rhone region, and the southern Rhone just south of the famous Chateauneuf-du-Pape. The CdP area makes the best wines of the Rhone, and also the most expensive. (Don’t get nervous. I haven’t forgotten I am the Mizer).The Rhone is a large area and the “Villages” appellation is a designation letting you know the wine you are drinking from the Rhone meets certain standards assuring you of a high quality wine. 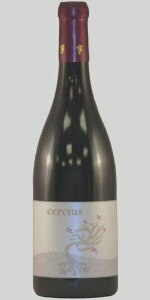 2010 Cercius is 85% Grenache (a.ka.a Garnacha) and 15% Syrah (a.k.a. Shiraz). The Grenache vines used in Cercius are 70 to 80 years old. If you are not used to “old world” Grenache, don’t think of it as the cool-aid wine we so often drink here. This is a "big" wine. While we do make good Grenache here, most consumed is that which has given the wine a bad reputation. Now ready for drinking, and aerated, the 2010 Cercius Cotes du Rhone Villages presented a more deliciously fruity nose with a hint of lavender. Whereas the unaerated wine was stark and flat and tannic, this glass came alive. It was softer, more balanced, offered dark chocolate and sweet cherry to the tasting. Oh, for some crusty French bread with braised beef and a salad or raw vegetable plate and a glass of this wine! 2010 Cercus Cotes du Rhone Villages would also pair well with lamb. Robert Parker says it is one of the best Cotes du Rhones he has ever tasted and awarded it 93 points. Cellartracker awarded it an average 88.7 points. And how much does this exquisite wine cost? Only $14-$15. At this price it also comes with the Wine Mizer recommendation. It widely available now, though only 5000 cases were made for world-wide distribution (and I plan to drink several more of them). Drink 2010 Cercius now through 2015. Just be sure to aerate it.